If you sail regularly you will know that keeping a log book isn’t always easy; just remembering to fill it in is a challenge in itself. In fact, actually managing to bring it with you can challenge some people. When you read your paper log, do you usually have your charts with you so you can see where that waypoint was? 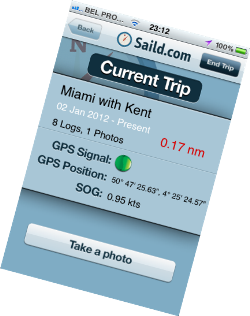 The folks at Saild have just launched a new iPhone app to help you log your sailing trips. The app is currently free and while it isn’t perfect, the developer's heart is definitely in the right place. The app doesn’t allow you to see where you’ve sailed on your phone, you have to go to your online log for this. Meaning that it’s not going to be any good as a ship's log if the authorities want to know where you’ve been. If you want turn by turn analysis it won’t do this either... yet. It is still in its infancy but it’s definitely a good start. As a concept, the groundwork is there. It was created from a belief that there had to be a better, more interactive way to keep a log. In essence, this app will keep track of where you’ve been and make it easier to document some of the memories along the way. At the end of your trip the app will upload to your online log. Once there you can add crew and further comments. If your goal is just to keep a track of where and how far you’ve sailed without too much complication, then for the vast majority of sailors this app will do the job. New Federal Boating Regulations On The Horizon? Remember Your First Time at a Boat Show? Biggest Boat Show Weekend of the Year?